Honda has released the first official image of the forthcoming Civic hatchback, that's due to bow at the IAA next month. The rear spoiler of the current car has been replaced by a large rear light bar, with LED's making up the rear lamps. Still, at least you acquire a wiper blade. Also absent from the new model are the angular slashes of the outgoing model. To make the car more aerodynamic, Honda has employed ex Formula 1 engineers. 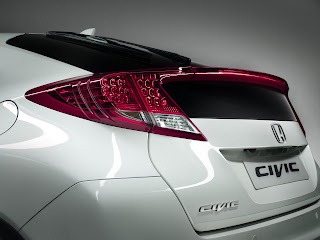 The new Civic will go on sale in the UK in January 2012.